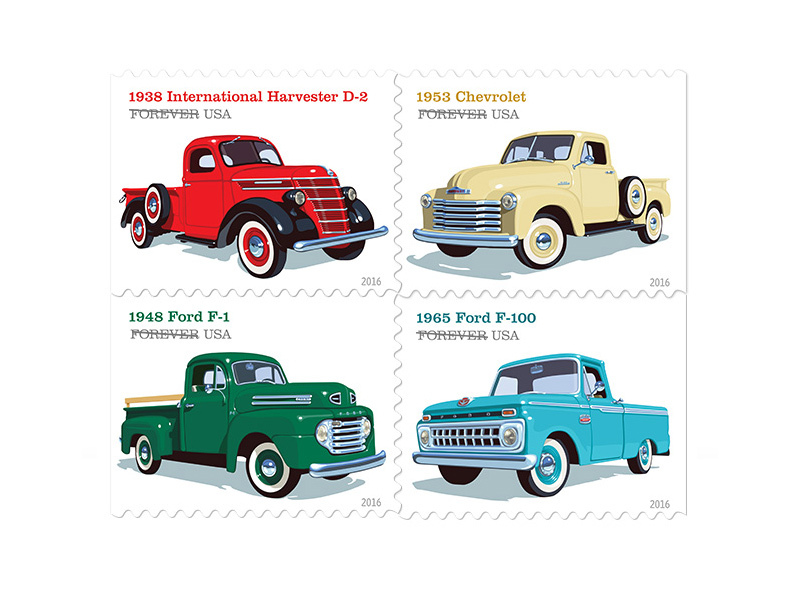 Each of the four stamps in the Pickup Trucks series features one of the following iconic models: the 1938 International Harvester D-2, the 1948 Ford F-1, the 1953 Chevrolet, and the 1965 Ford F-100. 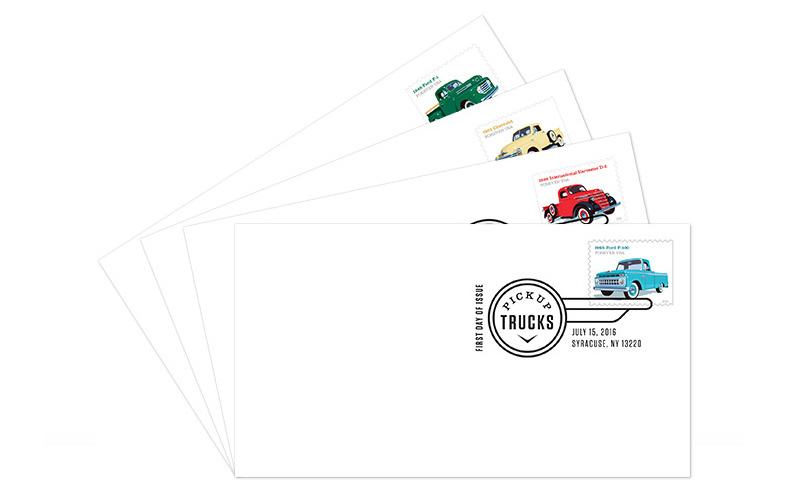 Artist Chris Lyons used Adobe Illustrator to create stylized renderings of the pickup trucks. 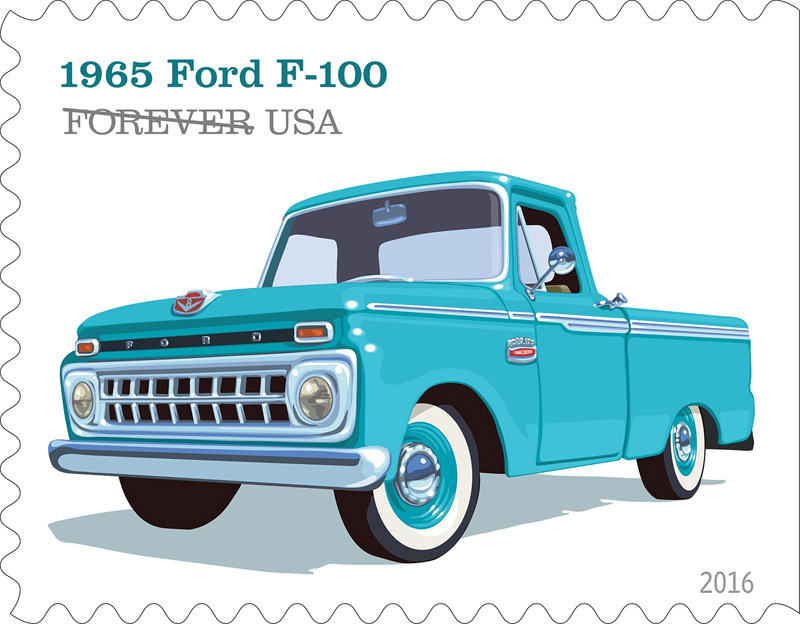 On each stamp, the name and model year of the truck are featured in the top left corner over the words “FOREVER USA.” Art director Antonio Alcalá designed the stamps. The images of the four “rugged and reliable work vehicles,” as the agency calls them, span 27 years of models. 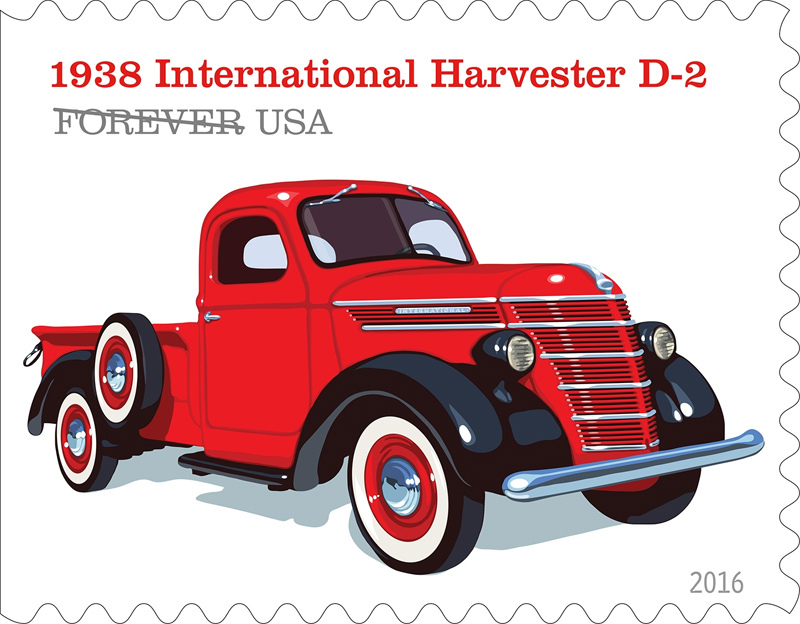 The oldest is the 1938 International Harvester D-2, which was among the first pickups to shift from purely utilitarian design to a more luxurious, stylish look. International Harvester was known for its agricultural equipment, but the D-2 boasted chrome trim in addition to a six-cylinder engine and its ability to carry half a ton of weight. 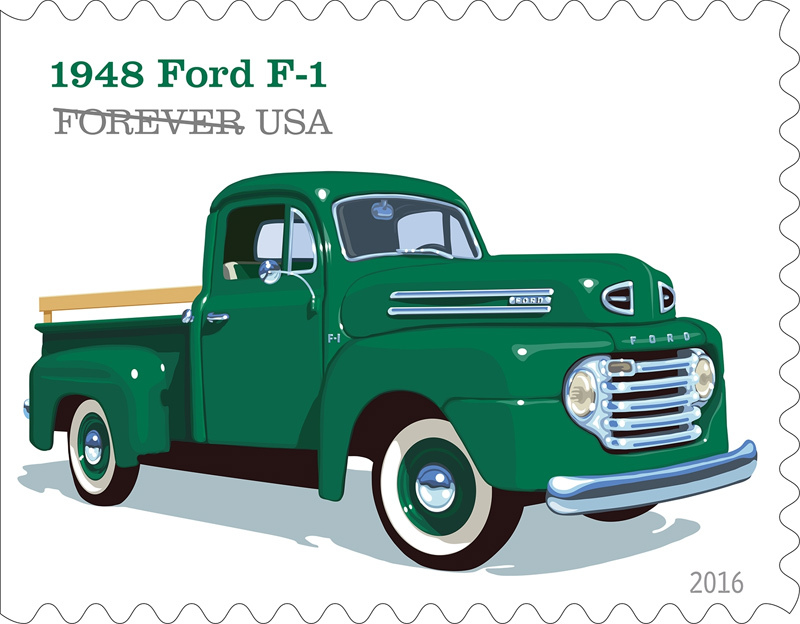 The 1948 Ford-F1 was the automaker’s first truck produced after World War II. The vehicle had a sizable “Million Dollar Cab” in addition to more sophisticated detailing and suspension. In its first year, it sold more than 300,000 units. The F-series has been the country’s best-selling truck since 1977 and vehicle of any type since 1982, according to Ford Motor Co. 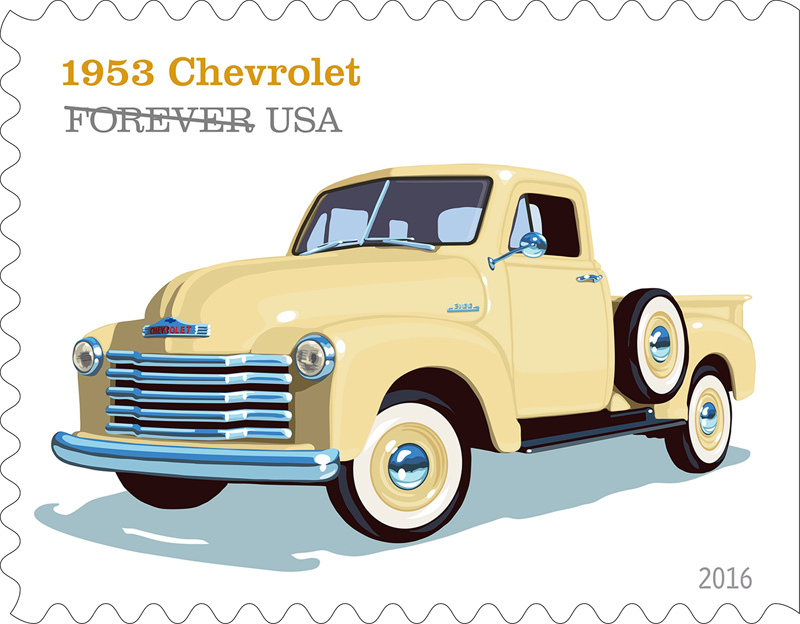 The 1953 Chevrolet 3100, with its distinctive wavy grille, also stars on the stamps. It’s part of the Advance-Design line, which debuted in 1947 and remained the top-selling pickup in the country for nearly a decade. The 1965 Ford F-100. This model had a brand new Twin-I-Beam independent front suspension, which improved ride smoothness and stuck around in some form until 1996. The vehicle also introduced an 18-slot grille.